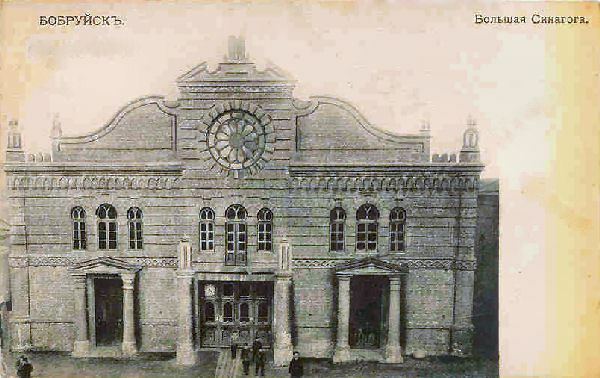 Babruysk, Babrujsk, or Bobruisk (Belarusian: Бабру́йск, Łacinka: Babrujsk, Russian: Бобру́йск, Polish: Bobrujsk, Yiddish: באברויסק‎) is a city in the Mogilev Region of eastern Belarus on the Berezina river. 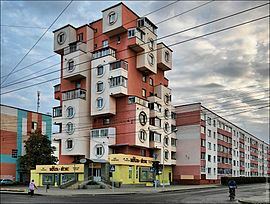 It is a large city in Belarus. As of 2009, its population was 215,092. The name Babruysk (as well as that of the Babruyka River) probably originates from the Belarusian word babyor (бобёр) (beaver), many of which used to inhabit the Berezina. However, beavers in the area had been almost eliminated by the end of the 19th century due to hunting and pollution. There was a steady increase in the Jewish population of Babruysk following the Napoleonic wars. By 1897, in the population of 34,336 citizens, 60%, or 20,760 were Jews. Most of them were employed in crafts, industry and trade. During the 1890s, the citizens of Babruysk witnessed pogroms after the assassination of the Russian emperor Alexander II. Many of the attacks were repelled by armed Jewish self-defense. In 1902, the Great Fire of Babruysk left 2,500 families homeless and destroyed over 250 business, 15 schools and the market. There were more than 7 million rubles in property damage, however the city was quickly rebuilt, this time with brick and stone. Between February 2 and March 11, 1918 was a Battle of Bobrujsk, between units of the Polish I Corps in Russia, commanded by General Jozef Dowbor-Musnicki, fought with the Red Army over the control of the city and region of Babruysk. In 1918—1920, town was captured by Polish liberation forces. In 1941, Hitler's forces invaded Babruysk. Believing that German troops would not target civilians, many Jews stayed behind. 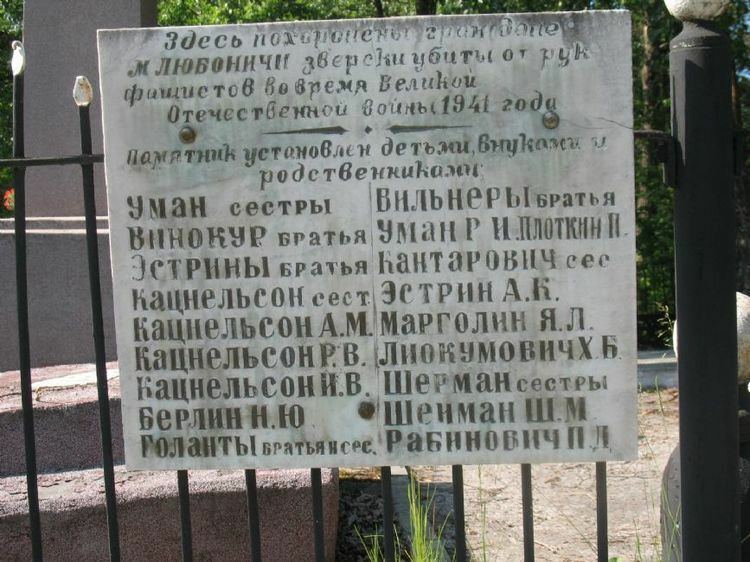 Consequently, 20,000 Babruysk Jews were shot and buried in mass graves. Ghetto and labor camps were established in the southwest part of town. The conditions inside the camps were horrible and involved lack of food, lack of sanitation and perpetual abuse by the Nazi guards. Soon the Nazis began executing the Jews in the ghetto in groups of about 30. By 1943 all labor camps have been liquidated and the remaining Jews killed. The few Jews who escaped joined partisan forces in the surrounding forest and went about attacking enemy railroad lines. There is a small memorial dedicated to the memory of Babruysk Jews killed in the Holocaust, located in the Nahalat Yitzhak cemetery, Giv'atayim, Israel, as part of the Babi Yar memorial. On June 29, 1944, the Red Army liberated Babruysk. The city lay in ruins; while the population had been 84,107 in 1939, it was down to 28,352 following the war. The difficult process of rebuilding was conducted by thousands of workers and war prisoners who labored to clear factories and streets of rubble and filled in craters made by the bombardment. The machine building plant had been almost completely destroyed, but was restored to working order by the end of 1944. Many other factories and facilities were also rebuilt. Between 1944 and 1954, Babruysk served as an administrative center of Babruysk Voblast. The population recovered swiftly as well. In 1959 it was 96,000, in 1965 – 116,000, in 1968 – 122,500, in 1970 – 136,000 and by 1989, 232,000 people were living in Babruysk. This was mostly due to urbanization, where people moved into the city from the surrounding rural areas. Gary Vaynerchuk, serial entrepreneur, CEO, investor, author, public speaker, internet personality and self-proclaimed owner of the American football team New York Jets. Efraim Sevela, was a Soviet writer, screenwriter, director, producer, who after his emigration from the Soviet Union lived in Israel, USA and Russia. Andrei Arlovski, mixed martial arts champion. Maxim Neafit Bujnicki (born in 1981), Ukrainian film director and screenwriter. Celia Dropkin, American Yiddish poet. Arkadi Duchin (born in 1963), Israeli singer-songwriter and musical producer. Berl Katznelson (1887–1944), chief figure in Labor Zionism, instrumental to the establishment of the modern state of Israel. Ruslan Kogan Australian entrepreneur and self-made millionaire. Kadish Luz, Israeli Minister of Agriculture (1955–1959) and Speaker of the Knesset (1959–1969), acting President for one month in 1963. Grigory Nemtsov (1948–2010), Latvian journalist and politician. Yitzhak Tabenkin (1888–1971), Zionist activist and politician, one of the founders of the Kibbutz Movement. Avraam Zak (1829-1893), Russian-Jewish banker and philanthropist. Both founders of the Russian band Bi-2 were from Babruysk. In the Star Trek: The Next Generation episode titled Family, there is an Earth Station Bobruisk, named for the city in Belarus. In Tanki Online there is a map titled Bobruisk loosely based on the city. This climatic region is typified by large seasonal temperature differences, with warm to hot (and often humid) summers and cold (sometimes severely cold) winters. According to the Köppen Climate Classification system, Babruysk has a humid continental climate, abbreviated "Dfb" on climate maps.